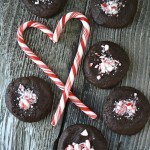 These Candy Cane Crumble Nutella Cookies are a perfect holiday treat! Easy to make and eat! For the fun part, put the candy canes into a ziplock bag, and using a heavy ladle (or hammer), crush the canes, but don’t pulverize them! Hammer out your holiday frustrations!! Crush. Crush. Set aside. In a bowl, whisk together flour, baking powder, salt and cocoa. Set aside. In another bowl cream together the butter and sugars, until smooth and creamy. Add the vanilla. Mix well. Add the Nutella and mix again until smooth. To the Nutella mix, add the flour mix in 3 parts, alternating with the milk. Mix well. Refrigerate your batter for at least 15 minutes. After the batter has cooled, it is ready to go. Line a baking sheet with parchment paper. Then take 1 tablespoon of the batter and roll it into a ball, and space them about 1 1/2 inches apart. Lightly press down the ball. Bake for ~10 minutes. As soon as the cookies come out of the oven, make a well in the centre of the cookie with your finger, by lightly pressing down, and add about 1/2 tsp of the candy cane crumble.